My relationship with Star Wars has been long and very rewarding. It has taught me lessons in not giving up, of right and wrong, it has given me friends (real and otherwise) who will always be there even if the actors who portray them on screen won’t be. It has even opened up doors to other forms of entertainment that I would not have opened if it hadn’t been for the Wars. Heck even my career choice has been influenced by Star Wars and its story. Sometimes I forget how many books, movies, and comic books I’ve been exposed to because of my love of Star Wars. So many artists, musical composers, and directors it’s quite staggering. I’m going to try to remember them now and share them with you, starting at when my fandom evolved from a kid and his toys to teenager noticing that there’s more to Star Wars than the funny names and cool spaceships. I had picked up my first comic book around the age of 17. It was Classic Star Wars #1–the reprints of the Archie Goodwin/Al Williamson newspaper strips in comic book format. It wasn’t an immediate love, but I eventually fell head over heels with that series and went on to read the Dark Empire and the Tales of the Jedi series and all of the Dark Horse titles following. I naturally progressed to reading other comic book titles–discovering artists like my favorites Doug Wheatley, Francisco Frankavilla, and Gabriel Hardman. I then discovered comics like Preacher, Saga, Paper Girls, and so many more great writers. Image Comics publishes most of my favorite titles. I’ve always been an avid reader, but it wasn’t until I started reading Edgar Rice Burroughs’ Tarzan that I really discovered the genre that I really called to me; pulp fiction. I immediately fell in love with his writing style I knew right then that was what I wanted to do. But how does one write 1910s style pulp fiction in the 21st century? I’ll let you know when I figure it out. 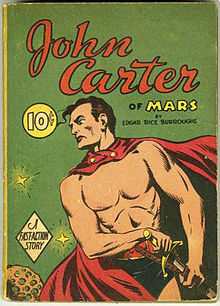 From there I read his Barsoom series (aka John Carter of Mars series of books)–there are 11 in all, I’ve read the first 5 with intentions to finish the series. The only reason I read those books to begin with is because I read about how much of a fan George Lucas was of his books. How can I forget the classics? Homer’s The Iliad and The Odyssey, Virgil’s The Aenid, Beowulf, The Canterbury Tales, Thomas Malory’s Le Morte D’Arthur, Paradise Lost, and Faust. I’ve even branched out on my own apart from Star Wars and discovered artists like William Blake and Gustav Dore. Soon after I also read the complete run of Flash Gordon comics and from that discovered artist Alex Raymond. Right around the same time I read the complete run of Weird Science/Weird Fantasy comics published by EC in the 1950s. Combining ingredients like John Carter, Flash Gordon and the Weird Science comics presented me with a dish that would lead perfectly into the main course. I’d be remiss if I didn’t include the works of Joseph Campbell and even psychologist Carl Jung and his work on the collective unconscious. Not long after I digested the print format, I eagerly turned my attention to the film influences because as it happened in Lucas’ real life, he had entered college and nearly died in a car accident. This life altering event caused Lucas to take life more serious and started taking film courses at USC. Akira Kurosawa was at the top of my film viewing list. With films like Seven Samurai, Hidden Fortress, and Yojimbo and Sanjuro one can visually see in motion picture Star Wars really being brought together. Effects like wide shots of battle scenes and camera uses no one has attempted before with quite the same effectiveness. Next on my radar were Lucas’ student films and from there I watched Arthur Lipsett’s short film, 21-87. There were several other experimental and avant-garde film makers I discovered as well, namely Stan Brakhage. Russian directors like Eisenstein, Pudovkin, and Dovzhenko and all of their films were highly influential on Star Wars because of their film style as Lucas was a huge fan of film montage. Even after in the days after Lucas’ retirement, Star Wars continues to expose me to great films and stories. Every time a new movie is announced and a director along with it, I’m scouring Netflix to find the director’s past films and any movies they reference when preparing. Another area Star Wars has opened up to me was movie soundtracks and musical composers. I was exposed to classical musical at a young age through my father who would play classical music constantly in our house. John Williams was probably one of the first non-classical composers I was exposed to. Since I’m from the Boston area and Williams conducted the Boston Pops, he was a common site on television especially during 4th of July celebrations. Of course one of the classical music composers I listened to was Richard Wagner whose themes and motifs were one of the aspects of his music that made him famous. Many of his works, including The Ring, were influences on Williams. Naturally I moved onto more film scores like the works of Gustav Holst, Igor Stravinsky, Bernard Hermann, Miklos Rozsa, and Korngold to name a few. When I think of all the areas I’ve been turned on to, I think I’m not expert in any of them but I am familiar with at least some of them, and for that I’m really thankful to George Lucas for unintentionally opening my eyes . Without Star Wars I highly doubt I would ever learn of so many classical poets, writers and artists. Hi Melinda! Sorry for the delayed response. Life has been crazy busy lately. I just love how Star Wars has exposed so much to me and in so many different areas. It’s amazing.